Did Cubs baserunner Anthony Rizzo's collision with Padres catcher Austin Hedges at home plate violate Rule 6.01(i), designed to prevent the frequency of such avoidable contact? The Play: With one out and one on (R3), Cubs batter Kris Bryant hit a line drive to Padres center fielder Matt Szczur, who caught the ball as baserunner R3 Rizzo tagged up and attempted to score as part of a sacrifice fly. 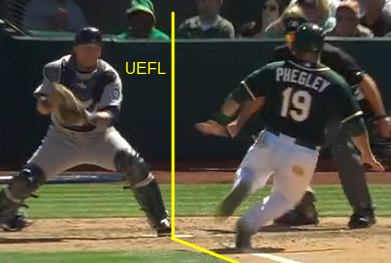 Padres catcher Hedges caught Bryant's throw, and collided with Rizzo, holding onto the baseball as HP Umpire Jeff Nelson ruled Rizzo out on the tag. Hedges suffered an injury as a result of this play and left the game; he also missed Tuesday's game due to a bruised thigh. R3 Rizzo initiates an avoidable collision. Short Answer: Rule 6.01(i)(1) states that a runner attempting to score may not initiate an avoidable collision with the catcher. Replays indicate catcher Hedges gained possession of the baseball prior to Rizzo's arrival and did not block access to the entirety of home plate, such that when baserunner Rizzo made contact with Hedges, he did so without taking an unobstructed path to score and, accordingly, initiated an avoidable collision. This is a violation of Rule 6.01(i)(1), and, had Hedges not maintained control of the baseball through the collision, Rizzo would have been declared out—via Replay Review or otherwise (Padres Manager Andy Green was seen exiting the dugout mere moments after the collision; he very likely would have challenged the play had "safe" been the call)—for having violated home plate collision Rule 6.01(i)(1). Important Note (Live vs Dead Ball): Assume the situation, all else equal, was zero outs with runners at first and third base. As Rizzo tagged to score, the trail runner at first base tagged and advanced to second base. As Hedges lay on the ground following his collision with Rizzo, this trail runner seized the opportunity and took off for third base. By rule, Rizzo's illegal collision caused the ball to become dead. If the trail runner had not yet achieved second base at the time of the collision, he would be returned to first base. If he had touched second base prior to the collision, he would be placed on second base as a result of the ensuing dead ball ("the umpire shall call the ball dead, and all other base runners shall return to the last base touched at the time of the collision"). Diagram of Rizzo's pathway deviation. Sidebar: Note that we didn't discuss the issue of whether Rizzo specifically deviated from his direct pathway to home plate in order to initiate contact with the catcher. This is because Rizzo's actions were illegal whether or not he deviated in order to perform his maneuver. As a comprehensive look, Rizzo did additionally deviate from his direct pathway to home plate, as evidenced by his position while running toward home, just outside of the dirt circle, with both feet in foul territory, and his final position at the moment of contact occurring fully in fair territory and in front of home plate. This is not an "out of the base path" style deviation, but it is a deviation nonetheless that explicitly fails to comply with the restriction imposed by Rule 6.01(i)(1). Anatomy of the runner's lane to home plate. Long Answer (and text of the Rule): In 2014, Major League Baseball adopted Rule 7.13, entitled Collisions at Home Plate, and designed to decrease violent contact between runner and catcher on plays at home. A runner attempting to score may not deviate from his direct pathway to the plate in order to initiate contact with the catcher (or other player covering home plate), or otherwise initiate an avoidable collision. If, in the judgment of the umpire, a runner attempting to score initiates contact with the catcher (or other player covering home plate) in such a manner, the umpire shall declare the runner out (regardless of whether the player covering home plate maintains possession of the ball). In such circumstances, the umpire shall call the ball dead, and all other base runners shall return to the last base touched at the time of the collision. If the runner slides into the plate in an appropriate manner, he shall not be adjudged to have violated Rule 6.01(i). The catcher and runner are both legal here. Rule 6.01(i)(1) Comment further advises all parties on the runner's responsibility: "The failure by the runner to make an effort to touch the plate, the runner’s lowering of the shoulder, or the runner’s pushing through with his hands, elbows or arms, would support a determination that the runner deviated from the pathway in order to initiate contact with the catcher in violation of Rule 6.01(i) (Rule 7.13), or otherwise initiated a collision that could have been avoided." The catcher, pursuant to Rule 6.01(i)(2) must concede a path to home plate if he is not in possession of the ball, though he is permitted to block the plate if he does have the ball: "Unless the catcher is in possession of the ball, the catcher cannot block the pathway of the runner as he is attempting to score. If, in the judgment of the umpire, the catcher without possession of the ball blocks the pathway of the runner, the umpire shall call or signal the runner safe." Thus, under one precise set of circumstances, home plate collisions are still legal: 1) The catcher has possession of the ball, and 2) is blocking access to home plate, 3) the runner initiates an unavoidable collision in an attempt to touch home plate, 4) does not deviate from his direct path to home plate, and, 5) it is not a force play. Conclusion: Rizzo violated Rule 6.01(i)(1) in multiple ways. Rizzo's slide is illegal at the lower levels. BRD, College and High School: NCAA Rule 8-7 states, "If the defensive player blocks the base (plate) or base line with clear possession of the ball, the runner may [avoid], slide into or make contact with a fielder as long as the runner is making a legitimate attempt to reach the base (plate). Contact above the waist that was initiated by the base runner shall not be judged as an attempt to reach the base or plate." Accordingly, the contact, initiated by runner Rizzo above the waist, is illegal in college. This even gets into "roll block" slide territory, where Rizzo's feet contact the ground while his torso remains nearly vertical so near to home plate that he likely would have rolled over had he not collided with catcher Hedges. NFHS Rule 2-32 defines illegal slides. Relative to the Rizzo-Hedges play, 2-32-1 defines its illegality: "If a runner slides feet first, at least one leg and buttock shall be on the ground." Since neither buttock made it to the ground prior to the collision, the slide is illegal. This is interference and the ball is dead immediately (8-4-2b). It might even qualify for Rule 2-32-2d ("the runner slashes or kicks the fielder with either leg") or 2e ("the runner tries to injure the fielder"). NCAA: When a flagrant collision occurs, as in 8-7, the runner is declared out and ejected from the game (like high school, the ball is immediately dead). NFHS: When malicious contact occurs, the penalty is the same as NCAA (dead ball, runner out, ejection). Rizzo very likely initiated malicious contact, insofar as high school rules are concerned. The Federation actually added "Legal slides" as its fourth Point of Emphasis for the 2017 season. 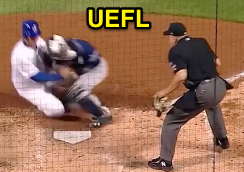 This play was reviewed as part of the Umpire Ejection Fantasy League's Ask the UEFL series, in which any UEFL member or guest may request review of a close or controversial play in baseball. Requests may be made via Twitter (@UmpireEjections or @CloseCallSports), Facebook (/UmpireEjections), e-mail or via reply to any post on the CCS/UEFL website.